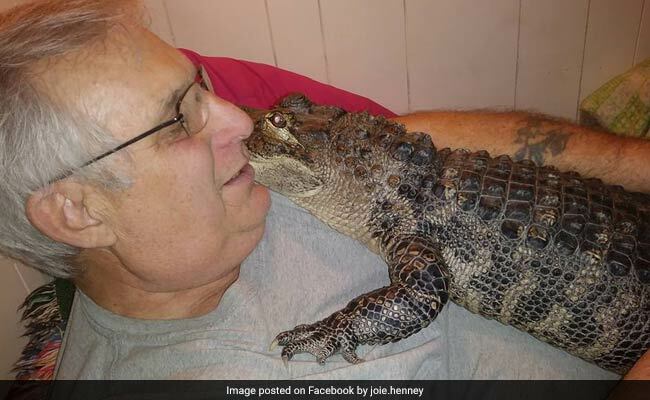 A Pennsylvania man has received viral Internet fame for his rather unusual choice of an emotional support animal – a pet alligator. According to People, Joie Henney of Strinestown keeps a 4-foot-6-inch alligator named Wally as an emotional support animal. Wally is a registered emotional animal to help with Mr Henney’s depression, according to Philly.com. He has become the first American alligator to be registered as an emotional support animal. “He likes to give hugs,” says 65-year-old Mr Henney. “My doctor wanted to put me on depression medicine, and I hate taking medicine. I had Wally, and when I came home and was around him, it was all OK,” he added. Mr Henney received Wally about three years ago from a friend who rescues gators in Florida, reports York Daily. Today, Wally and Scrappy, Mr Henney’s other rescue alligator, live in a pool he has built in his living room. Wally likes to eat chicken wings and watch The Lion King on TV. He also likes attention, lots of it. However, Mr Henney admits that living with an animal that cannot be properly trained is a taxing task. Wally, who has free range of the house according to the York Dispatch, loves to mess up made beds and clear out the bottom kitchen cabinet to lie down.